Just stayed for 3 nights over Easter with partner. It was my sixth stay – all others as solo business trips. I really cannot fault NABSA. It is exceptionally well run. The accommodation is well appointed, sparkling clean and very comfortable. Anja and Angela are the most hospitable, efficient and welcoming hosts. The location is quiet but has fab access to the airport and the city and also good quality restaurants and shopping that are within short walking distance. I always feel very welcome and very secure travelling alone. Recommend highly. What a great place to stay. The location is close to public transport with a free bus service to the Adelaide CBD. The room we stayed in was immaculately clean, functional and had every amenity required, including parking. All of this coupled with competitive rates and a great selection of local restaurants….. whats not to like. My choice of these boutique apartments was the closeness to the city centre, as well as to the Adelaide Aquatic Centre for my fitness activities. I thoroughly enjoyed my four week stay at NABSA. I appreciated the way the apartments blend with the local area, in a street lined with leafy trees. From the coffee machine in my elegant and practically decorated room to the daily attention of my room servicing, the quality body products and managers who looked after my requirements, it was a joy to stay there. The laundry is well equipped and I was able to hang my washing outside on the lines to dry The residential location provided me with interesting walks (NABSA also have free rental bikes) and I noticed many homes had a blue plaque with historic information. Nearby in the Village is a supermarket, or I could go to the city centre, or catch a 22_ bus to stop 21 on Main North Road for shopping centres. NABSA is between Jeffcott and O’Connell Streets, both of which have a choice of buses, as well as being able to take a shortcut to Tynte Street for the free Connector buses. A visitor was also able to park on the premises. I researched NABSA before making the booking, as well as making enquiries directly. I also spoke with a guest who returns regularly. I would certainly like to visit NABSA again in future. Positive: Soooooooo clean. Loved everything about this place. It is spectacular value for money. Great bed, wonderful bathroom amenities, easy after hours check in and check out, beautiful street location and easy access to a selection of restaurants and cafes. Room was perfect. Obviously, I will return. Negative: There wasn’t a thing I didn’t like. I always enjoy my stay at North Adelaide Boutique Stays and was very happy with my brief visit over the weekend. Great location to an abundance of fabulous eating places. 2 minute walk to buses to go into Adelaide CBD. Clean and comfortable rooms with an incredibly comfortable bed. On site vending machine with meals if you don’t feel like going out. And a handy laundry with an outside clothes line. A real bonus when away from home. And the staff are always welcoming and happy to help with anything you need. Love this place. That’s why I’ve been coming back for 15 years. Number one on my list of places to stay. One of the most impressive things about NABSA is providing a very good sparkling in the mini bar (well priced too), champagne flutes and a champagne stopper. Comfy bed, ambient lighting, space, good quality bathroom products and super fast free wifi all add up to an above average experience for a very good price. Excellent accommodation, price and location. I visit Adelaide regularly for business and NABSA is my preferred accommodation. The price is very affordable, the rooms are excellent in their cleanliness and appointment (equivalent of 5 star in thr CBD), and parking is provided at not extra cost. Short walk to an array of fabulous dining options on O’Connell street. Short walk or free bus to the CBD. Highly recommended. As a regular business traveller to Adelaide, NABSA is my preferred accomodation. It’s centrally located, modern, exquisitely clean, and with spacious rooms and WIFI if I need to get some work done. The manager is always courteous and helpful. Highly recommended. 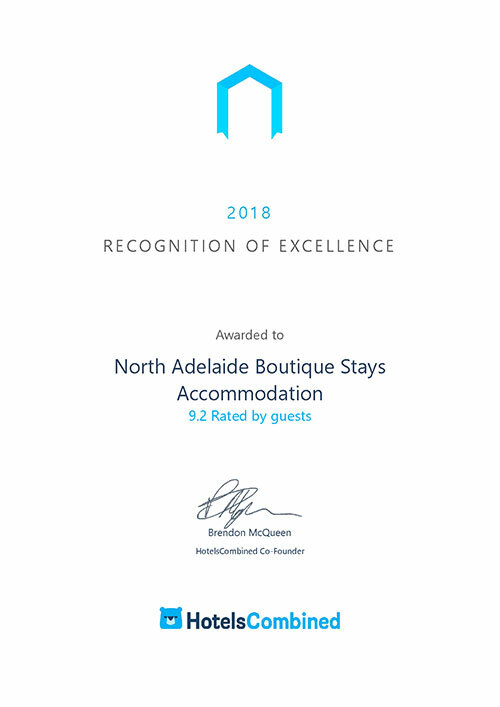 As a regular to the North Adelaide Boutique Stay, I am constantly amazed at the dedication of the team that make this gem my number one place to stay in Adelaide. The accommodation is fantastic and supported by great facilities in a very convenient location. Then – you add the little extra’s that come with your stay and you have a winner – thank you to the team for looking after me so well this year. Fabulous Accomodation in a great location. Close to the city and cafes and restaurants. The staff are kind, professional, generous and offer above and beyond customer service. With off street parking and a laundry on site it is perfectly self contained and fairly priced. Unlike the majority of Accommodation options in Adelaide NABSA pricing remains consistent throughout the year with no price gouging. The rooms are exceptionaslly well kept and clean and the mattresses are supportive and current. Couldn’t ask for more at a fair price. Our Go To for our regular trips to Adelaide and our recommended option for visitors. My partner and I stayed overnight mid-week for a concert at the Entertainment Centre, which is a convenient 10 minute drive away. Anja greeted us upon arrival for a quick and easy check-in and she then personally showed us to our room. We booked a Spa Room for the first time which was immaculate (as every room we’ve stayed in has been), modern and nice and cozy (the heater had been turned on prior to our arrival). Despite the property being fully booked for the night, we still managed to get a park right outside of our door which made unloading the car a breeze. The car parks are spacious and secure and we’ve never had a problem getting one even when checking in later in the day. We love the location – Gover Street is easy to find, set back from main roads so there’s minimal noise pollution is a short walk to and from O’Connell Street which is great for grabbing dinner or supplies from the large service station on the corner. Yet again the bed was so comfortable and there were plenty of pillows, as well as tea and coffee supplies including a pod coffee machine. We always feel safe and secure staying at NABSA and the property has been consistently ‘low-noise’ every time we’ve stayed, during both busy and less-busy periods. I cannot recommend NABSA enough, whether for short or long stays, during the week or over a weekend. It is always our go-to when needing modern, clean, convenient accommodation in Adelaide. We will absolutely be back! Lastly, if you’re looking for somewhere to have brunch after check-out, we’d recommend The Flying Fig Delicatessen which is just down the road from NABSA on Jeffcott Street – easy to find for perfect coffee, filling meals and funky digs! The perfect combination of the indoor and outdoor designs made me feel staying at home. Initially, I opted for this accommodation mainly for free parking and wifi. Having said that, after my trip, I found that the impressive services provided by the staff as well as the exterior and fittings of the accommodation formed part of my good memories of Adelaide. In fact, the atmosphere in the accommodation created by the staff and hardware was far better than anyone else. In particular, the staff were really helpful for satisfying my requests which let me complete my trip smoothly. I would like to say that it is one of the best accommodations/hotels that I have ever stayed. A sophisticated, modern, contemporary comfortable studio apartment that ticks all the boxes for all one needs. Parking particularly fine, so convenient. Free Wifi a plus when you travel with family or business. Excellent staff, a fabulous lot of information on the area. Location, location, location… walking distance to some amazing restaurants, Japanese, yummy Burgers, an authentic Marrakech Restaurant, a 24 hour bakery, banks, supermarkets, gas stations, gastronomic pubs, a well priced Thai massage centre offering several wellness therapies (open till 9pm) & stunning parks etc. North Adelaide is a divine, posh tree-lined inner city suburb & easy walking distance to the CBD. We walked to the CBD to visit the SA Art Gallery, meandering through stunning parks that past the zoo. We visited the Adelaidian born pandas so adorable! The Gover Street North Adelaide Apartment Boutique Stays are a perfect stay, a safe and quiet area (from 11pm – 8am to be very quiet) & earlier the life on the high street (O’Connell Street) was fun, people out & about enjoying a variety of good food establishments & for guys there is even a late night barber called ‘Handsome’ a very hip Baber’s Shop this area is perfect for an evening stroll. This is modern accommodation in a great quiet spot close to North Adelaide’s restaurant strip. Staff were helpful and friendly on check-in and throughout our stay. Wifi was reliable and quick. Recommended. From the moment I enquired over the phone about a booking, to the end of our stay, both Anja and Angie were ultimate professionals. I knew we had chosen accommodation which was going to be special. My mum and I stayed here in December to attend a week-long round of medical appointments with specialists in North Adelaide. We have stayed in many hotels, apartments, medical accommodation etc in Adelaide over the past 15 years prior to and after mum’s surgery and North Adelaide Boutique Stays was hands-down the most luxurious and comfortable of all. It’s just what you need when you have the added stress of a worrisome medical condition. Coming back to our modern, immaculately clean upstairs Studio room each afternoon with 2 King single beds, we could relax and then decide about our evening meal. We could order takeaway delivered to our room, stroll to a restaurant (Angie kindly offered various discount vouchers from local pubs towards the end of our stay), or heat up a delicious frozen pasta meal from the vending machine downstairs in our kitchenette’s microwave. We stocked up on bread, butter and vegemite from the nearby supermarket to make toast downstairs in the vending machine room each morning for breakfast.You can make complimentary cappuccino coffees in the front office after 8.30am, or use the Nespresso machine in your room. There’s also complimentary apples, cookies etc. in the front office too. Every little thing has been thought of to ensure a pleasant stay, like a home away from home. I used the spotless, coin-operated laundry facilities at NABSA and hung my clothes on the lines in the sunny paved courtyard behind the laundry, pegs also provided of course. Nothing was too much trouble for the incredibly helpful Angie. She called taxis for us to go to the hospital and specialist appointments, printed out medical forms for us, was incredibly concerned about my mum’s health and took a genuine interest in us, not just as paying guests, but offered to help in any way she could to ensure our stay was pleasant and comfortable. Now, you don’t get that very often! We were made to feel most welcome and will definitely return. NABSA is conveniently located 1km from The Women’s and Children’s Hospital and just a short walk to the O’Connell Street restaurants, pubs and shopping centre. You won’t do better if you are looking for immaculate accommodation in North Adelaide! Ein sehr modernes und gepflegtes Hotel mit sehr schönen Zimmern. Der Empfang war sehr herzlich. Man kann in die Stadt laufen und der Weg vorbei am Park, dem Stadion und dem Fluss ist richtig schön. Gleich um die Ecke vom Motel sind gute Restaurants und Bäckereien für ein leckeres Frühstück. Wir würden immer wieder dort hingehen. What a gem! North Adelaide Boutique Stays was the perfect accomodation for our family when we came to Adelaide to spend Christmas with family. It is spotlessly clean with wonderful amenities including off street parking comfortable beds and even complimentary bike use which the kids loved! Great cable tv free Wi-Fi coffee pod machine and all spotlessly clean along with great aircon- really important for the 40 degree heat,.but amongst all of this excellence was the sensational and exceptional staff. The customer service was amazing prior to our stay through the booking process and during our stay. Anja and Angela were brilliant and made us feel like welcome old friends .this is how customer service should be.It made our stay in Adealide just perfect. What a wonderful stay we had at Boutique Stays Accommodation. I cannot begin to say enough great things about Angela and Anya. They went above and beyond in ensuring our needs were met. Whether it was suggestions on restaurants, putting a cot in our room for our little girl, making a call to return a gift item, providing a nice sendoff on our last night. I mean these little things all add up to big things and if we return to Adelaide, I can’t think of a better place to stay. It’s also really conveniently located to shops, restaurants, the post office, the library, and shopping center. The room was modern, clean and the bed very comfortable. The bathroom was very clean with quality toiletries. There is a mini-bar, a Nespresso style coffee machine with pods, a high mounted TV easily viewed from the bed and parking outside the room. Most of all Anja was absolutely delightful and couldn’t have been more helpful, offering excellent options to eat and drink locally. The property is situated in North Adelaide and surrounded by great arty bars and eateries. Also, only a 15 min walk to town through parks and gardens. Down the street is an American style Deli named the Flying Fig serving tasty breakfasts, such as Latke or Rueben sandwiches and delicious coffee. My wife and I recently stayed at the complex and were looked after in a wonderful manner, nothing was too much trouble and I would highly reccomend to anyone thinking of a trip to Adelaide forget the CBD and stay in this wonderful location ,eateries are a short stroll away and the city circle bus can get you to where you need to to go. Angela at reception was a marvel who nothing was too much trouble for her. If you want a peaceful quiet classy place to stay this is it and no, the plane noise was not too bad either. I have been staying here for almost 2 years for regular business trips and spend 21 nights here per year. The standard of accommodation is excellent and always presented in a spotless condition. I have gotten to know Angela and Anja and they are also part of the reason for me returning. They will go out of their way to always help with any request and are perfect people for the job. The location being so close to O’Connell St allows me to entertain my clients and also provides for any need I have while visiting. The value for money here is excellent with top quality fittings and equipped with coffee machine and microwave. I travel often and this is my favourite destination. Highly recommended. The room was very clean, modern and comfortable. Free coffee pod machine and wifi access with ipod provided. Great to have a microwave to reheat food with dinnerware and cutlery. Wonderful. Mini bar well catered for as well as a selection of nibbles. Good TV coverage. 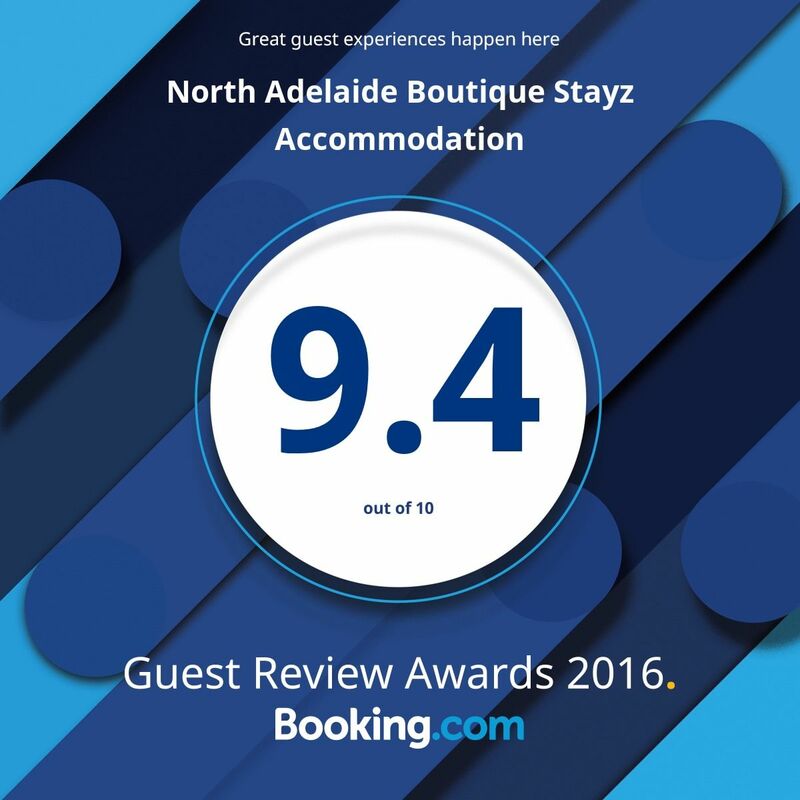 North Adelaide Boutique Stays Accommodation Is an great hotel to stay in North Adelaide. The staff are very friendly, and helpful. The rooms have a Tv (foxtel), fridge, microwave, kettle, and a Nespresso machine with complimentary pods. There is a coin operated laundry, a snack distributor and a frozen “home made meal” distributor. With an assortment of pasta dishes available. The location is excellent, situated in a quiet street. There are lot of bars and restaurants to choose from within walking distance, even a 24h bakery. The taxi ride to the airport took about 20 min (late evening) and cost around 30$. We thoroughly enjoyed our stay at NABSA. It is newly refurbished, very tastefully decorated and immaculate; also has a very good selection of items in the mini bar and a Nespresso coffee machine. The location is excellent being in a quiet street, with restaurants and shops just around the corner, and could easily walk into the CBD. The staff were very welcoming. We will definitely be back. My second stay was equally as welcoming and comfortable as my first. A cold week in Adelaide but knew my room would be preheated and comfortable. The shower is excellent, bed is cosy, mini bar is well stocked, décor is tasteful and room is spacious. We stay often. The staff are friendly. Location is quiet & close to city & Childrens Hospital. Disabled suite is comfortable & clean. Having the lift & hospital bed is a godsend & makes traveling easier. I have stayed at NABSA over 25 times and never had a problem, not once. It is always my first choice staying in Adelaide. A great location for the city and the north. Modern, clean luxurious rooms serviced by friendly, helpful and professional staff. A home away from home. Delightfully surprised to find such a well presented and pristine hotel in North Adelaide. The rooms are tastefully decorated with quality furnishing and fittings, all modern and new. Great little extras with a coffee machine and well stocked snacks and mini bar. Nice and quiet with no noise from other guests. Could not have wanted for more and value for money was excellent. We stayed overnight in the spa room and absolutely loved how luxurious it was and all of the little special touches such as the pod coffee machine, iPad, Television above the spa, double shower, eye masks and slippers etc. Absolutely could not fault our stay or the room. Would highly recommend to treat yourself and book a night in a spa room! What a great little spot!! Comfortable, quiet and a top location. Within walking distance of almost any cuisine you could want or for a lazy stay in just visit the vending machine room; what a clever idea! Super easy after hours check in too. See you next time North Adelaide Boutique Stays. We live 230klm away in the Mid North and we have stayed at North Adelaide Boutique Stays Accomodation half a dozen times now. We will keep coming back to this beautiful accommodation because of the following reasons…. We love the cleanliness and comfort of the rooms and the off street parking. The free WiFi is a great bonus too. We look forward to seeing Angela whenever we stay. She is just lovely and so friendly and also a great asset to this business. We really do feel welcome when we see her! The lovely restaurants on O’Connell Street are a 5 minute walk and if you want to get into the city and not have to worry about finding a costly car park, a taxi ride is under $10. I would not stay anywhere else in Adelaide unless NABSA was booked out. I have stayed several times now and all I can say is that Angie and her team run an immaculate facility. Spotlessly clean and taking every possible guest need and wish into account, it is my go to place when working in Adelaide. Mints and biscuits in the rooms, Nespresso machines with genuine gourmet coffee pods from The Grind in Central Markets, and everything so guest-focused, you relax as soon as you arrive. But the most important aspect is the warm and friendly staff, greeting guests with a smile is lovely and you are always personally shown to your room. A good nights sleep is always assured and even there is even a heat and eat meal facility for in-rooms meals or a short walk to O’Connell St for a wider choice. Thanks. This was our first stay here in a three bedroom apartment. The reception staff member was very friendly and helpful. The rooms are new, modern, very clean and spacious. The interconnecting rooms meant that we each room had a bathroom which was convenient. The kids loved the 40cm TVs and free WiFi. We have a larger 4WD car so the parking is a bit tight, but manageable. We’ll definitely stay here again. We stayed as a family group, in 5 rooms. All ages were happy – even the 13yr olds! The facilities are excellent, with quality fittings & finishes, and the food & snack vending machines are a great option for “in room” eating. It is so close to all that O’Connell Street has to offer, and is an easy walk into the Adelaide Oval, Museum, etc. The staff were all friendly & professional – we have only praise for this place! My partner and I absolutely loved our recent stay here. The location is incredible, we literally walked everywhere we needed to. Anja was so helpful and gave as great tips on how to get the most out of our stay. Our room was kept clean and was very comfortable – great value for money. And we loved that there were bikes available to borrow at no cost so we could explore the amazing bike tracks Adelaide has to offer. Cannot fault our stay at all, would highly recommend to all.